Powers/Abilities: Thanks to extensive training, Shaft is proficient in a wide variety of fighting techniques, but it is his mastery in the area of ballistic weaponry that earned him his namesake. His weapon of choice is a specialized bow, which was chosen over conventional weaponry both for its hi-tech appearance and its use of Katellan anti-gravity technology, making the traditional string apparatus unnecessary. Accompanying the bow are a variety of "specialty" arrows used in a wide range of different combat scenarios. The consummate leader, Shaft has a commanding personality and a keen mind which allows him to quickly size up any situation and make whatever decisions necessary. His strong personal charisma and resolute determination inspire trust and loyalty within the team. History: Jeff Terrell was an elite FBI operative prior to his selection as leader of Youngblood's "home" team. Chosen primarily because of his strong leadership abilities and his movie star good looks, Jeff was the logical choice to replace the more intensely-driven Battlestone when he was forcibly removed from his position as team leader. The swift transformation into the public persona known as "Shaft" ensued, giving him instant media exposure and firmly establishing him as a hero to the American public. Despite the fame and fortune resulting from his new-found notoriety, however, Jeff resents the media attention and despises the costumed artifice associated with the Youngblood program. Comments: Created by Rob Liefeld. 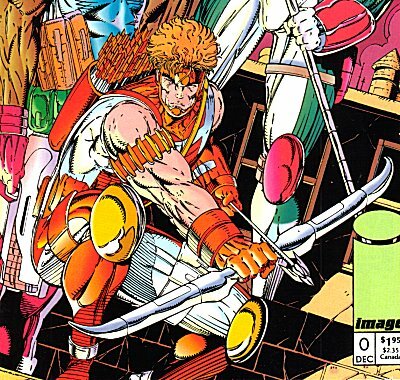 On why his primary weapon is a bow: "I developed my proficiency at archery as a young boy and its stuck with me ever since, which is why the guys in PR choose to outfit me with a high-tech compound bow instead of something along the lines of what you'd find in Chapel's armory . While there are times when I question the convenience of using a bow as opposed to a gun, it's definitely one of the easier weapons to carry around, not nearly as heavy as that thing Chapel totes around! Also as Timer loves to remind me, it looks good on film. This particular bow is quite different from anything ever used by anyone outside of the Youngblood program. Designed by Sentinel and based on Katellan technology, it isn't so much a high-tech bow as a linear accelerator. Simply put, it creates a small circular field of gravity in which I place the shaft of the of the arrow. When the arrow is drawn back, the tip activates a small(2mm)gravity well, propelling the arrow through it and toward its target at varying speeds."